Apple today launched Safari Technology Preview, a new version of its web browser aimed specifically at developers. Safari Technology Preview is aimed at giving developers a way to access new web technologies Apple is planning to implement in iOS and OS X, offering an early look at new developer tools, layout technologies, visual effects, and more. 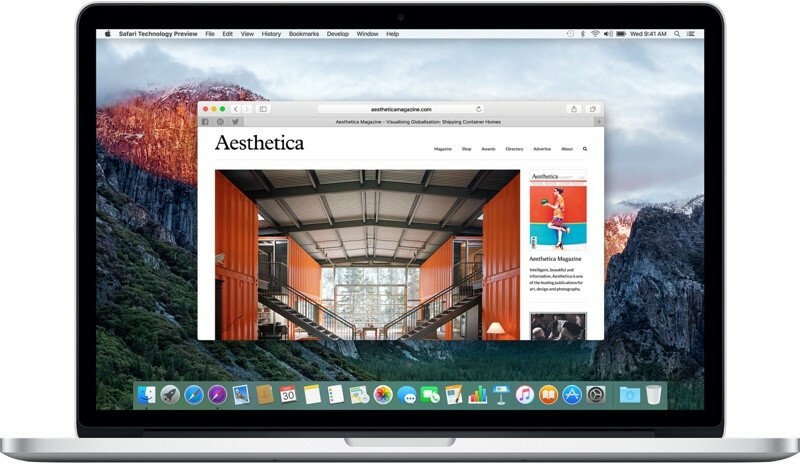 According to TechCrunch, Apple's goal with Safari Technology Preview is to gather feedback from developers on its browser development ahead of launch through a method that's more easily accessible than WebKit. Safari Technology Preview can be run side-by-side with the existing Safari browser, and it's able to be set as the default browser on a machine. It includes local data stores for history, bookmarks, cookies, and cache, and it supports syncing of browsing history and bookmarks over iCloud. Visually, the Safari Technology Preview icon is designed to resemble the Safari icon, but it is purple in color instead of blue. Safari Technology Preview can be downloaded immediately from Apple's Developer website and it will receive regular updates through the Mac App Store. While designed for developers, Safari Technology Preview does not require a developer account to download. The best part about this for me is that the icon is purple. They should make this available for iOS. How are professionals using iPad Pro supposed to test their websites? If Apple doesn't take the iPad Pro seriously then professionals aren't going to use it. This just goes to show how iPad Pro is not really a laptop replacement after all (just one example out of many). It's a marketing gimmick. Will this allow me to actually close YouTube tabs and windows without crashing the entire GUI ('https://discussions.apple.com/thread/7282867') and forcing me to restart, unlike Safari? How long do we have to go before Safari can work with YouTube on recent machines with El Capitan again? I have not experienced this once and it is not at all normal. Do you have any third-party extensions or plugins that may be causing this? I strongly suspect any actual useful feedback coming from actual developers is going to be drowned out by the cacophony coming from the hipsters / fanboys / other people with too much free time on their hands. I'm very excited and I don't know why. Anybody know why Apple stopped making the Windows version of Safari? What could motivate Apple to bring Safari back to Windows? When Safari for Windows launched, browsers on Windows were a mess. The choices were Internet Explorer and Firefox, neither of which were compliant with web standards to the extent WebKit was. Safari offered Windows users a browser that was more compliant with web standards. Today, there are many more browsers for windows, and several of them use WebKit. There is really no point anymore. Plus, with the iCloud for Windows, you can sync your bookmarks and passwords regardless of which browser you use. it was horrible and no one used it. Combine that with total dominance by the other players (IE mainly at that point but secondarily Mozilla) and it just didn't make sense to compete there anymore. Will it finally support webm? I thought lack of webm was just because I don't have Flash. Isn't webm Flash based? I just tried it and it worked fine for me on current safari. Do you have third party plugins installed? Won't change much. Compared to Chrome, the feature set is terrible. I'm not talking about "Extensions" other user facing features. As a frontend developer, I see every day quirks and stuff that Safari doesn't support and chrome does. But until Google gets their act together in-terms battery optimisation and efficiency, Chrome will never be a option for me on notebooks. It's not as terrible on Windows as on Mac OS X, but it's still bad. And there has been tremendous issues with Chrome's "Hardware Acceleration" on Windows 10, especially with NVIDIA graphics cards. It's most obvious with the new MacBook 12-inch. You can slice off 2-4 hours of battery life running the same web content using Google Chrome compared to Apple Safari. And that's with Chrome's pepperflash disabled using about:plugins. The CPU utilisation with Chrome is 80-120% (above 100 means it's running in turbo boost), while with Apple Safari it's rarely above 10%. The difference is quite ridiculous. Even worse scenarios are Mac notebooks with both integrated and dedicated graphics card, as Google Chrome for some reason insists on activating the dedicated graphics card all the time for no apparent reason. Running Apple Safari compared to Google Chrome on my MacBook Pro 15-inch with Retina sporting the GeForce 650m was quite ridiculous, not only in battery life but even more so in heat and fan noise. And it's getting really annoying that Google simply refuses to add HLS support in Chrome. It shouldn't be hard to do at all, but they insists on it being a non-standard they simply won't support forcing me to either use services like Twitch.tv with Flash Player, or use another browser entirely.